Apparently it's even better than I thought. It shows what I know. It seems like a very bad idea. To my (nonexpert) eye it looks like possibly a low-value cello even if it were in top condition. This, on the other hand, is in very poor condition. There's a high risk that you will waste all your money on it, for nothing. And restoration, even if by some miracle you can manage to do competently and without causing further damage, will cost you another pile of money and huge amounts of time to learn how. Sometimes I'm wrong about the value of instruments, but in this case I would certainly want strong evidence to the contrary before I risked any money on it. You said your current cello is good. There you go. If you really must have a better cello, I think you need to find a better way. 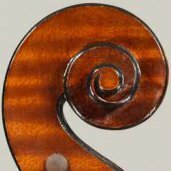 EDIT: The ebay auction is here: https://www.ebay.com/itm/italian-4-4-CELLO-to-restore-TESTORE-old-violin-violon-violino/173769932457?hash=item28757ebea9:g:C2QAAOSwFSNcUfNS . I think we're not supposed to comment on ongoing sales, but this seems blatant. The description looks intended to deceive. It hints that you're getting a Testore for nothing, but there are very many obvious mistakes and contradictions, and few actual claims, so the seller can claim ignorance. It looks like low-end workmanship to me, and the instrument is a wreck. Keep in mind that I too can claim ignorance, but good look finding an expert who thinks it's a good deal. Sometimes they don't even look at it. All they need is a piece of paper. Houshold LED lights than don't strobe? Does anybody know of any? I found these: 6W, 500 lumens https://www.amazon.com/Byingo-Crafting-Simplicity-Stepless-Adjustable/dp/B073TTJW1Z/ref=cm_cr_arp_d_product_top?ie=UTF8 7W, 800 lumens https://www.amazon.com/Joly-Joy-Flexible-Gooseneck-Brightness/dp/B076LBYYFG/ref=cm_cr_arp_d_product_top?ie=UTF8 12W, 1200 lumens https://www.amazon.com/gp/product/B07GPJJPHF/ref=ask_ql_qh_dp_hza All have adjustable brightness and color temperature. All are claimed to be flicker-free. I was asked to straighten a cello bridge that was almost folded in half (I'm only exaggerating a little--it was really warped). Since the student was supposed to play in a few minutes, I put a sweater under the tailpiece, gave the standard disclaimer (we don't want to be responsible for wrecking your cello) and pulled it back into position. The next week I saw it again, and it was like new. The student's father had taken it off and steamed it flat. The good news is that if they start to warp, the player can fix them just by standing them up straight. I see. So it's a climate thing. Aw, for gosh sakes, guys. Why don't you just install a humidifier on your furnace? If it cleans up OK, then I guess you can't ask for more. It doesn't show signs of wear. 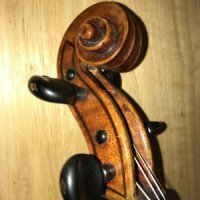 Most violins that have been played consistently over the years will show considerable wear on the varnish where it's contacted by the hand, and maybe by the shoulder. Yep, it's definitely an alligator. It's nice to look at as a decorative object, but it doesn't look very practical. It looks like it hasn't been used much. Latest eBay Purchase - in a Maine attic for decades! Hermann Bischofberger. Is my memory faulty? There was a violin maker in Seattle whose violins have extreme craquelure. I've seen several of them, and to the best of my recollection, they all look like that picture now. Yep. If it were mine and I wanted to use it, I would have it repaired, or outright refinished. It's really unsightly, and it would be embarrassing to play. I could sell it for next to nothing and buy another violin, or I could get a functional instrument out of it. There's not much to lose. False sentimentality seems misplaced. For what it's worth, this is how I would do it with what I have. This requires camera capable of saving RAW files (for linearity), but it doesn't require any funny electronics. This isn't a good measurement. It's just a demonstration of concept. This is a pencil wrapped with white paper moved fast through the field. It would need to be done a little better than this. It needs a uniform, black background, which can be measured and subtracted. (The background here is brighter than it looks.) A thinner, better lit object would give better resolution. It also needs to be held straight. For what it's worth, this was measured with ImageJ. Are you sure you can get a meaningful comparison? The way that's plotted, it doesn't look like you can even get the AC amplitude, because it's normalized to some arbitrary, small number. The software removes what little information there was. And without the DC component, you can't tell if you have 1% ripple or 50% ripple.